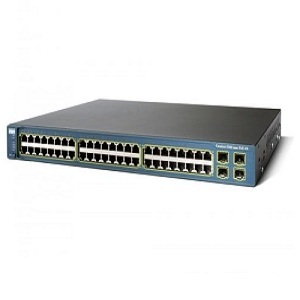 The Cisco Catalyst 3750G-48TS ethernet switch is an innovative switch that improves LAN operating efficiency by combining industry-leading ease of use and the highest resiliency available for stackable switches. This product series represents the next generation in desktop switches, and features Cisco StackWise technology, a 32-Gbps stack interconnect that allows customers to build a unified, highly resilient switching system one switch at a time. Routersale.com buy and sell used, refurbished and new WS-C3750G-48TS-S for cheap price in Toronto Canada and USA. And Routersale offers free shipping for most of the items to almost all cities including Toronto, Hamilton, Kitchener, London,Oshawa, St. Catharines–Niagara, Ontario, Montreal, Quebec City, Victoria, Vancouver British Columbia, Calgary, Edmonton, Alberta, Ottawa–Gatineau, Quebec City, Winnipeg, Manitoba, Halifax Nova Scotia in Canada. Please call or email us to see whether you can get promo code for free shipping on your purchase.. We have this model WS-C3750G-48TS-S in our Canada & USA locations. Customers from USA can buy from our USA Store.